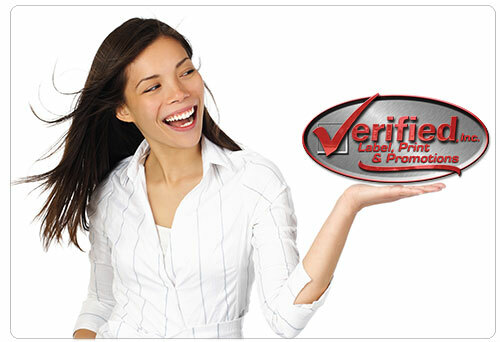 Why Use Verified for Printing, Labels & Promotional Products? Here's a better question - why not use Verified? We do all types of printing, labels and promotional products, so you can call us for everything. We treat you like an important client - even on your smallest orders - because we understand the value of our relationship. We’ll beat any other company’s pricing you can find, so you’re always getting the best deal. We’ll build your company a custom internet storefront, so you can do business electronically, throughout your entire company. Check out our Guaranteed Cost Reduction – it’s a completely fresh and unique way to do business. We inventory and distribute whatever you need, so everything is always ready and available. We have full graphic design and copywriting services, so we can help from start to finish. We have good old-fashioned customer service, with real people who answer the phone and return emails promptly. We’re a financially strong company, with 14+ years in business. We’re dashingly handsome, and we smell terrific. We listen to what you want, and then we offer multiple options to accomplish your goals. We guarantee everything that we do. If you’re not 100% happy, we fix it. We’re not joking when we say that if we weren’t already us, then we’d be doing business with us, because we like us, and you’ll like us too!! Why do business over the internet, with people you don’t know? You’re not really saving money, and we can prove it. All you’re really getting is impersonal service, from a company that’s spent thousands of dollars to build a computer system designed to minimize the need for people. Instead, you can establish a long-term relationship built on trust, and save money in the process.